Are those swirling leaves…or a monster!? Rabbit is eating cabbages in the garden while, nearby, Hedgehog searches for snails. A sudden wind comes up, stirring the colorful leaves, causing them to swirl in the air. Frightened, Rabbit screams and hides in a hollow log; Hedgehog follows him to find out what’s wrong. Shivering, Rabbit declares that there’s a big howling monster after them. When leaves blow into their hiding place, both animals panic and flee in opposite directions. After some running, both Rabbit and Hedgehog feel bad for leaving a friend alone with the scary beast and decide to return to help. Rabbit first adopts a disguise, smearing himself with mud and tying two branches onto his head to look like horns. Hedgehog rolls in a pile of colorful leaves and picks up two sticks to look like claws. When the two friends confront each other, they are scared all over again and run away…all over again. The running itself makes the disguises blow away, and before long the friends are reunited, eating in the garden as the wind continues to blow. Storyteller Albo offers straightforwardly simple silliness for the very young, who should love the heightened emotions and the repetition. 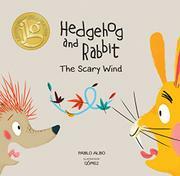 Gómez makes both Rabbit and Hedgehog highly expressive; most compositions are uncluttered, and tiny details will keep children engaged. Series companion The Stubborn Cloud publishes simultaneously.